Prota Name: the name you defined during setup. It will be displayed when you open your Prota Space. It currently cannot be changed once Prota is setup (feature will be available later this year). Prota ID: a unique 32-digit ID that is automatically given to your Prota during setup. It cannot be changed. You can also find it in Settings>System settings (see screenshot below). 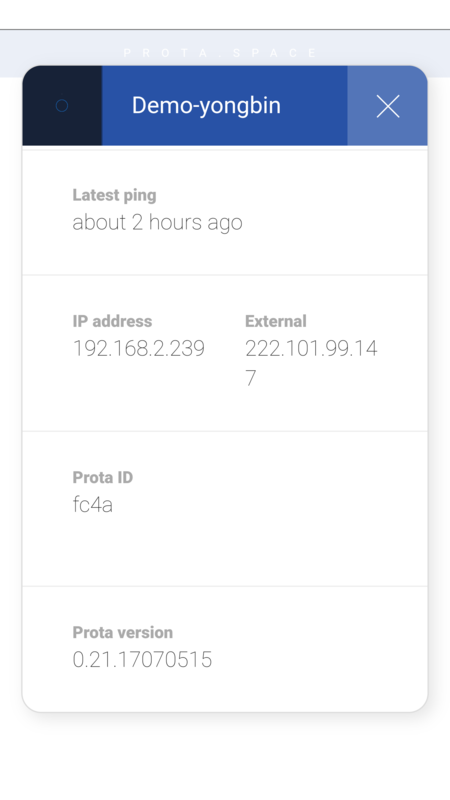 If your Prota is offline, click on your Prota from Prota Space to see your Prota ID. This ID might be required by our Support service. Moreover, as it authenticates you as an owner of Prota, it can be used for managing the purchase history of your device. Please keep it confidential.